I love March. It's springtime, the trees start budding, the kids are all muddy, it's my birthday and best of all ... it's reuben season! There is nothing better than the perfect reuben sandwich around St. Patrick's Day. Many people think I'm crazy since I love reubens, but I've never been a fan of sauerkraut until I started making it homemade and I don't eat corned beef. Well, let me tell you a thing or two. 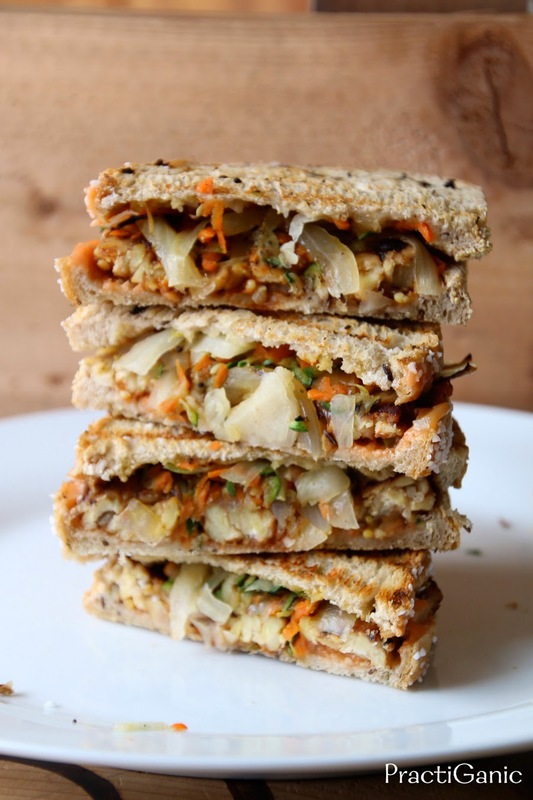 Tempeh Reuben Sandwiches are the best! Even though I love my veggie reubens, I used to always would leave the sauerkraut off of them (they were still great). Last summer, my aunt gave me a head of cabbage that weighed over 10 pounds from her garden and I already had two heads of cabbage in the fridge from our CSA. Let's just say the family was completely full of cabbage. I decided to try making my own sauerkraut. Even if I didn't like it, someone would try it and it was fun to learn how to do. Let me tell you something else I have learned ... homemade sauerkraut is NOTHING like store bought! I absolutely love it now. The whole family has been eating it. I made sure to save a couple jars for march so when it was time to go reuben crazy, I had some in stock. Besides my new love for homemade sauerkraut, another thing that will make or break this sandwich is the bread. Good bread determines if you will have a good sandwich. You need some fresh rye bread from the deli that will crisp nicely on one side and not get all soggy from the veggies. There's nothing worse than soggy bread on a great sandwich! You have been warned! 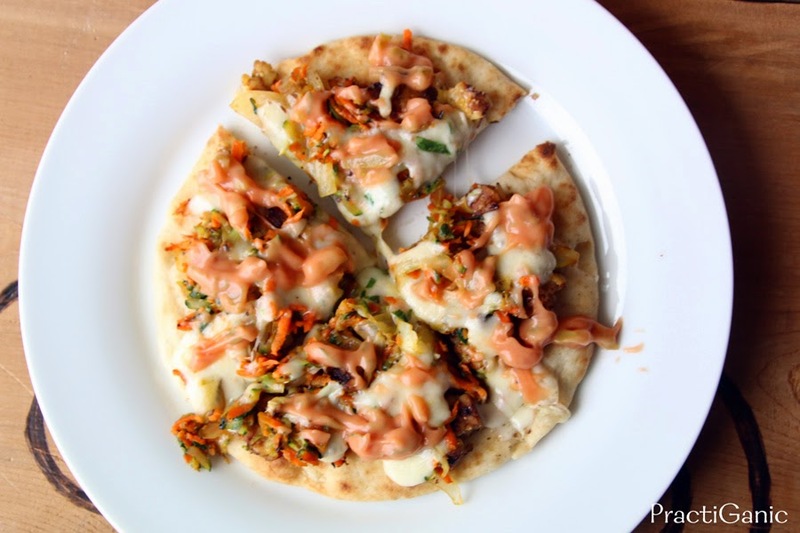 Sometimes I leave the sauerkraut off, sometimes I add cheese and sometimes I don't even make a sandwich and put all the ingredients on a pizza crust for a tempeh reuben pizza. 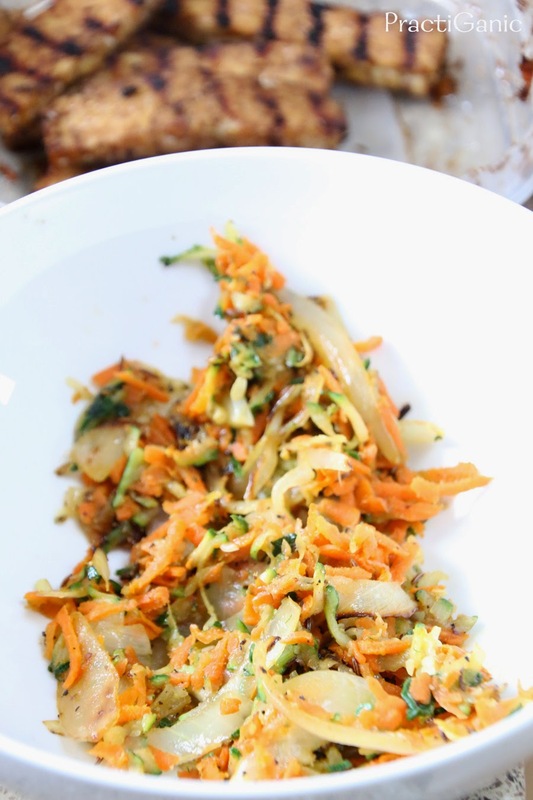 However you decide to change up this recipe, get ready for some of the tastiest tempeh you ever had! I could eat it straight out of the pan! First, cut your tempeh into 1/2 inch by 2 inch slices. Mix together tamari, balsamic, worsteshire and olive oil along with the first listing of caraway seed and garlic powder. Marinade the tempeh in the mixture for at least two hours. 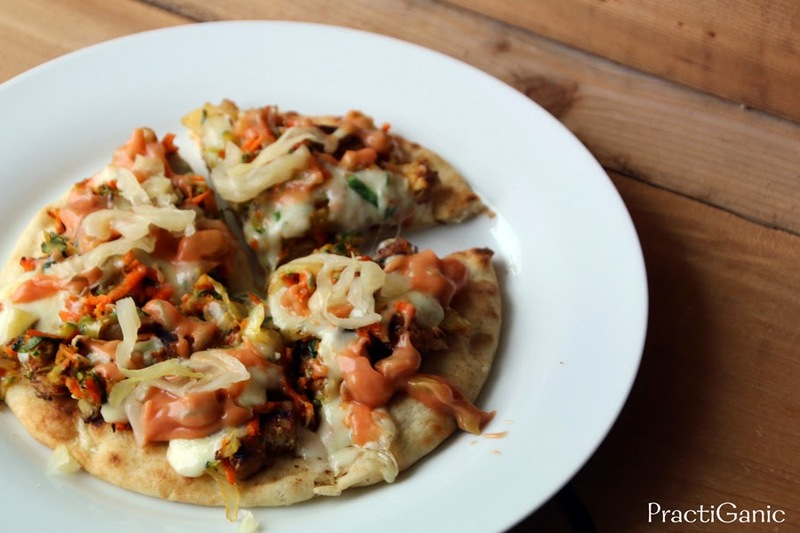 Meanwhile, mix together your sauce mixture so the flavors have time to come together. Next it's time to get the sandwiches ready. 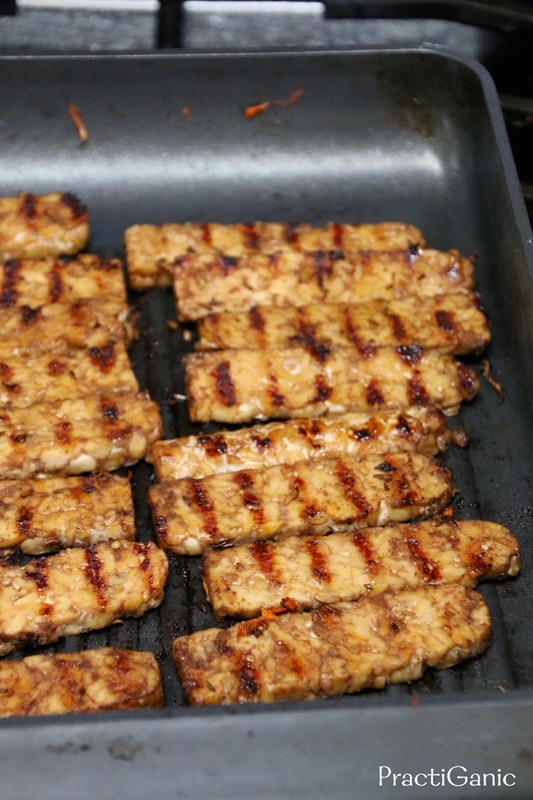 First, take the tempeh out of the marinade, begin to cook your tempeh over a medium heat. Set the marinade aside. Cook the tempeh for 4-5 minutes on each side. Once it's done, toss it back in the marinade for a little extra flavoring. Set them aside or keep them warmed in your oven at 170º until you're ready to assemble your sandwiches. Next, saute the onion in a little oil. Once it is translucent and getting caramelized, add the carrot, zucchini, salt, pepper and the second listing of caraway seed. Continue to saute them for another 3 minutes or until the veggies are al dente. Now, it's time to assemble your sandwiches. Spread the sauce mixture on one side of the bread. 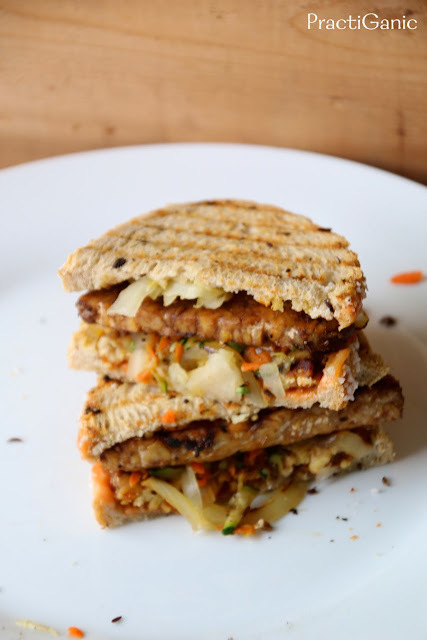 Top with a few slices of the tempeh, the veggie mixture and finally the sauerkraut. In the same pan, that you've been cooking everything else in add a little more oil and let it heat up. Add the sandwich and grill on both sides for 3 minutes or until it is brown and crispy. I couldn't help myself ... I had to save a bit of the ingredients for a pizza the next day!